By combining their 95mm Mak and Mobile Porta mount into the VMC95L 95mm f/11 Maksutov-Cassegrain Telescope, Vixen Optics gives you a complete and highly portable observation rig for viewing the Moon, planets, and other celestial objects. 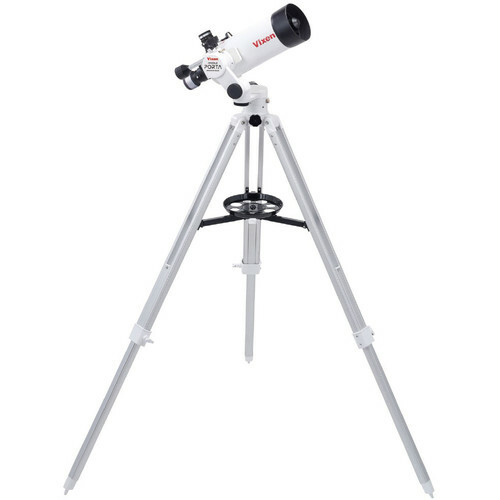 You get a Maksutov-Cassegrain optical tube assembly (OTA), the manual alt-azimuth mount with tripod, plus basic observation and alignment accessories. Lightweight, portable, and powerful, the Vixen Optics VMC95L 95mm f/11 Maksutov-Cassegrain Telescope is an ideal choice for observation or imaging. It features an internal flip-mirror mechanism that allows the light path to be directed toward one of two points: 90° upward or straight through. This configuration supports the use of two eyepieces for quickly changing magnification without having to switch eyepieces, or of an eyepiece at the 90° position and an imaging system straight through. For imaging, simply flip the mirror up to check alignment and tracking accuracy between exposures and flip it back down to use the camera. The straight-through port has threads that accept most imaging and camera mounting rings for eyepiece projection, prime-focus, and afocal imaging techniques. Optically, the Maksutov design exchanges the conventional front corrector plate of a Schmidt with a convex meniscus lens, resulting in a smaller secondary mirror that limits obstruction and increases contrast while eliminating the need for periodic collimation. The Maksutov optical path results in a narrower field of view versus a similar Schmidt, but the optical benefits, when coupled with the VMC95L's larger aperture and multi-coated optics, make this an ideal scope for solar, lunar, and planetary observations, while being able to resolve bright deep-sky objects like stars, clusters, galaxies, and nebulae. This version of the VMC95L is offered here without a mount or tripod, for users who have a reliable support system, but a Vixen-style dovetail plate is included to accommodate a variety of mounts. For observations, a 25mm eyepiece is included, as is a red-dot finderscope and bracket. Equipped with two fine adjustment handles for whole-circle slow-motion control on both axes, the Vixen Mobile Porta AZ Mount comes with a sturdy tripod that adjusts from 28 to 51" to accommodate a wide variety of users and viewing positions. As the name suggests, the Mobile Porta is optimized for travel with a folding fork-arm design and its ease of use helps to minimize the common support-system-oriented frustration often experienced when searching for and tracking celestial objects. It has an 8-pound payload capacity for smaller telescopes like refractors and Maksutov-Cassegrains, and is recommended for optical tube assemblies (OTAs) with a diameter of 119mm (4.6") or less for safe use. Its friction control system allows you to move the mount by hand without fumbling with locks or clutches and stays in place when it's released, and its slow-motion handles enable fine position adjustments while minimizing vibrations. Eyepiece Barrel Diameter 2 x 1.25"
Box Dimensions (LxWxH) 17.1 x 9.4 x 8.5"
Box Dimensions (LxWxH) 37.0 x 10.0 x 8.0"